As minor signs of fall tease us Angelenos with the notion of seasons, my posting of The City Prolific will become less frequent. Festival season has wound down, the outdoor screenings are over, and after Halloween, there just won’t be as much going on. This weekend, though, you’ve got to get out this weekend. I’ve gone to the event every year since I’ve lived here. The first year I attended, in 2008, I fell in love with its community feel. I was new to LA, and was amazed at how diverse it is, and the festival reflected this diversity – children and adults of all demographics took to Colorado blvd to dance, rock out, revel at the art and performances, and eat of the food trucks and festival food. Over the years, the festival has become much more crowded, the acts booked bigger and in more demand, and some of the original community spirit has gotten a little stifled. It’s also no longer free – it’s now $10. Despite these changes, it is still a great time, and the entry fee goes toward the Eagle Rock Center for the Arts, so it’s money well spent. Colorado Blvd. between Argus Dr. and Eagle Rock Blvd. Aventine Hollywood, you know that club that used to be the Spot, and the restaurant next door that has the really pretty back patio and a great happy hour? Well, they host cool events, sometimes. 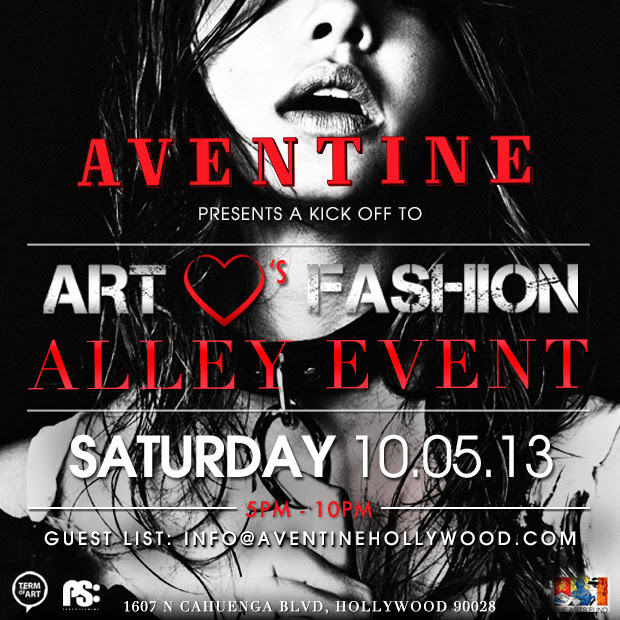 Tonight they present a hosted bar and free head shots (curious to see if this is liquor or an actor’s marketing tool) from 5-6 PM, a fashion show starting at 6 PM, an art installation throughout Aventine and the alley behind, live DJs, two outside bars, food, gift bags and more. Fans of gorey makeup fx rejoice. 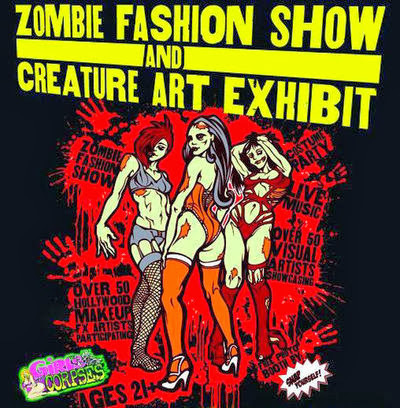 The Zombie Fashion Show and Creature Art Exhibit hits Lot 613 tonight. Dead models will strut their decaying stuff down the runway. Featuring fifty makeup artists will display their creepy talents, while up to 150 monster mash-ups will be on display as part of the evening’s art show. Live music and a performance from contortionist Dangerous D will take the stage. Costumes encouraged. Fake blood required. 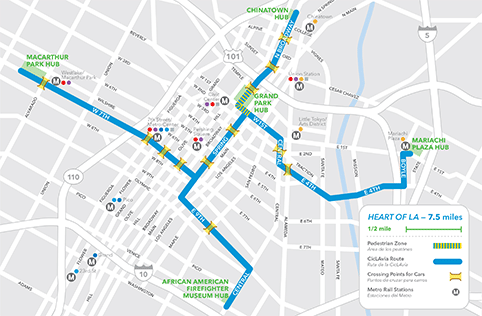 CicLAvia heads back to where it all started, taking over the streets of Downtown. Grab your bike, your skateboard, your longboard, or your sneaks, and experience the city without cars. It’s an incredible time. Check out the map for details. I usually post events $10 and under, but this one deserves a mention despite it’s $30 ticket price. The fifth annual Los Angeles Haunted Hayride opened last night. 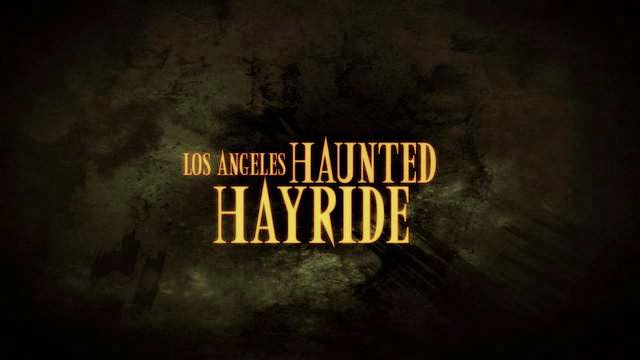 Held at the Old Zoo in Griffith Park (yes, there’s an old zoo – eerie ruins of concrete animal enclosures and abandoned cages), this year’s hayride will see the return of its infamous ‘The “In-Between” Dark Maze’ and “Purgatory” sideshow attractions, as well as the new “Carving Shack” (guests can pick out a pumpkin and wield some carving tools) and “Death Row” (an interactive room focused on historical death devices), in addition to its historical ‘scary-go-round,’ freak and magic shows, demonic stilt walkers, and more.